Geoff Thorpe said about long time bassist Tilen Hudrap: "Tilen is my brother, one of the most knowledgeable music guys in the industry and a hell of a player... he will always be part of VICIOUS RUMORS and our large family as well as one of my very best friends. We wish him all the best in his future projects. This current VICIOUS RUMORS lineup will tour the world together firing on all cylinders!!! Plans are already underway for the new album in between US and European tours next year. After 40 years changes are just part of any long running operation! We roll with them and always hire the most talented players available... hey if there also young and beautiful it's a bonus!!" VICIOUS RUMORS is almost half way through a massive 45 date US/Canadian Tour in support of the 30th Anniversary of Digital Dictator. The reviews for this tour are already coming in, Metal-Rules.com said, "I had waited almost 30 years to see them play and it was worth the wait. Don’t miss this tour! 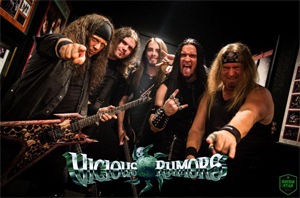 VICIOUS RUMORS stands as one of the longest running, most prolific US Power Metal bands in history." The European leg of the tour, presented by Eternal Rock Booking Agency, will happen in April 2019. Dates are listed below! With all this going on VICIOUS RUMORS has resigned with SPV/Steamhammer for 2 more studio albums. 40 years of metal VICIOUS RUMORS is going full speed ahead. The best is yet to come!